Ever since we first saw his 2011 Newport Film School Grad film The Man Who Was Afraid of Falling, we’ve been following and featuring the work of filmmaker Joseph Wallace with some fervour here at Directors Notes HQ. In the five years since he first appeared on DN’s pages, his creative output in the field of stop-motion has made him a recognisable name in the world of puppet-based animation. Proving he’s got more to his arsenal than just stop-motion, Wallace returns to the cut-out animation style he effectively put to use in short film Natural Disaster with his latest music video for Parker Bossley track Chemicals. Joining us here on DN for a third time, we talk to the director about pushing the limits of collage animation and trying to adopt a more organic process. Can you explain the concept of the video to us and let us know a little about where the inspiration came from? The concept really came as a response to the song and the lyrics, which are quite clear in themselves, and wanting to find a metaphor for taking a trip that could involve a lot of visual play and surreal elements. The decision to use cut-out animation and collaged imagery was established early on so I developed this idea where the singer, Parker Bossley, could travel, as a character, between extreme, richly detailed locations. The notion of the metaphysical doors came from the idea of choices and decisions and the metamorphosis into different animals acts as a representation of the different faces we wear when we take chemicals. The video takes the themes of love, lust, seduction and chemicals and translates that to a world of exotic animals; predators and prey. 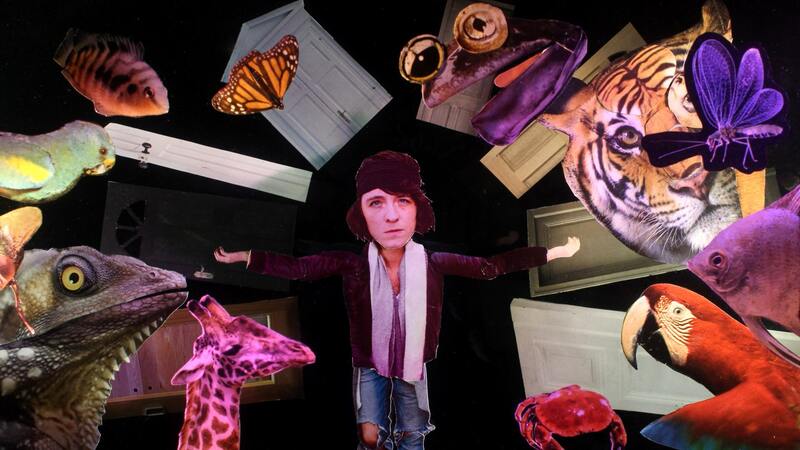 Last time we saw your work, it was with the puppet-based Edith Piaf music video for Sparks, you’ve now returned to the cut-out style of your short Natural Disaster – what made you return to this approach and how does this music video differ from your previous cut-out film? Deep down, puppet animation is my first love. The majority of my films are puppet animations, Piaf was puppets and my new short will be puppets but I do love the immediacy of cut-out animation and how you can afford, as an animator, to be a little more spontaneous. The reason for returning to this technique actually came from Parker though, he had seen Natural Disaster on Vimeo and really wanted to have something in a similar vein. I’d had a desire to return to that form of collaged animation as there were certain things I felt could be further explored so this was an opportunity to delve back into that technique. Firstly, I wanted to push the collage element to be a little less literal. Natural Disaster is mostly set in the ‘real world’ and this video really had the potential to be quite surreal and more abstract, so the first thing was to be looser with the collage and more associative with the imagery. As much as the piece is collaged visually, it was also collaged as a process. The main difference with Natural Disaster is that, other than the framing concept of doors leading to different locations, the content and story of the video came from what I’d call ‘structured improvisation’. Often, working with found images, you can’t find the exact element you need and you spent ages flicking through books and magazines trying to find some inane object from a certain angle and I didn’t have the liberty of time to support that. I also wanted to adopt a more spontaneous, organic process to what I had on Piaf and what I’m having on my new short where things are much more meticulously planned and designed and storyboarded. So having established the concept, a lot of the actual content came from looking through imagery I’d gathered, pulling out things I liked and putting them under the camera and improvising shots. So, as much as the piece is collaged visually, it was also collaged as a process. I’d shoot one moment, add that to the edit, see where it best clicked with the music, shoot something else and bit by bit build up this tapestry of scenes to then create a whole. Can you tell us a bit about the cut-out process – how long did it take to create this video, what tools/software do you use? In my mind, cut-out animation is one of the most immediate forms of animation. It’s a quicker process than puppets, especially with this found-image style, as you can find am image, cut it out and have it under the camera, in a scene, in a matter of minutes. Due to previous commitments I had quite a fast turn around on the video so I brought in French Animator Marie Lechevallier to animate with me. Marie is currently working at Aardman, she was an animator on Early Man and now the second Shaun the Sheep film but she has a background in cut-out animation so she’s very comfortable with the process. After animating each day we’d go and watch various cut-out animation films and take inspiration from the different approaches to layering and movement. Marie and I built a multiplane together for the video which is about 2 metres high by a metre wide, this meant that I could achieve a much greater level of depth and have a larger plane of action than what I’ve been able to do previously. When Marie joined me, her and I were taking it in turns to animate shots on the multiplane whilst the other gathered images for the next set-up. After a while it became apparent that, for schedule reasons we should be animating at the same time so I then built a mini-multiplane where we could do close ups and smaller shots so that we could both animate, practically back to back, simultaneously. The technical challenge was to achieve an animatable kaleidoscope effect, in-camera. With each project I do I try and set myself various aims which might be artistic or technical related. For Chemicals I had the idea of distorting and fragmenting the images to give the sense of viewing the world through the filter of being under the influence of some substance or other. This, paired with the quality of the instrumentation of the track made me think of a kaleidoscope. So the technical challenge was to achieve an animatable kaleidoscope effect, in-camera, as I always prefer to do things practically as opposed to in post. It took a while to get right but I built a rig to hang under the camera that supported a kaleidoscope lens that could be animated frame by frame to create the spiralling effect. The video actually stars musician Parker Bossley, how did you work with him to get all the images needed to bring him to life through cut-out? And where did you source the other imagery from? As Parker had approached me to direct the video, I hadn’t done an initial treatment for the song as I might normally. So we had a conversation and talked through the themes of the piece and our interpretations of the song and he expressed from the start that he’d like to appear in the video somehow. So I gathered a lot of promotional shots he’d had done by the photographer Ronnie Lee Hill and then also gave Parker a list of mouth shapes to make for the lip sync sections which he then went off and photographed on his phone. Once I had all the source imagery, I then printed pages and pages of photos of Parker at different sizes and cut these up to create various versions of him, some from the side, some frontal, some with wings, tails, fur etc! I raided my collection of old books and magazines before venturing out to charity shops and responding to Gumtree ads for magazines so that I had a large stock to draw upon to create the imagery. Can you give us an update on your future projects? At the start of the year I took on an old industrial unit in Bristol which I’ve been turning into a new animation studio called Hangar Puppet Animation Studio. I’ve brought together a few independent animation people to share the studio with me and I’m also using it as a space to nurture new talent like the brilliant Heather Colbert who made the Dolly Said No To Elvis music video last year. It’s a larger space than I’ve had before and having a group of us to pool resources means we’re all better supported. Chemicals was shot here and a few other commissions so the shoot spaces are busy already which is wonderful. I’ve also been developing my new short film for longer than I care to think about but due to the funding climate for independent animation in the UK it’s been very hard to get it off the ground. I’m working with Manchester-based production company Delaval Film [producers of previous DN features Marina and Adrienne & Lambing Season] on the project and I’m pleased to say that we are finally going into production in the next couple of months which is really exciting. The film is called Salvation Has No Name and is a political allegory exploring xenophobia and faith. I’ll be posting updates of the production on my Instagram and all going to plan, the film will be hitting festivals Autumn 2019.